China's transition from a planned to a market economy and its "opening" to the outside world, initiated under Deng Xiaoping, unleashed a plethora of changes throughout the country. One result of the economic reforms has been the creation of a new business elite in China. The economic impact of this new business elite is unquestioned, but what is its political impact? Is it, as often assumed in the West, a carrier of democratization? While members of China's emerging business elite have benefited greatly from the new economic freedoms in China, have they pushed for political reforms as well? 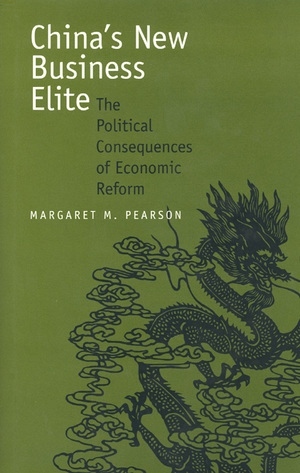 To explore this question, Margaret M. Pearson conducted extensive interviews during the first half of the 1990s with Chinese-born managers of foreign-backed joint ventures and wholly foreign-owned companies in China. She further researched the activities of domestic-sector entrepreneurs. Pointing to the new business elite's newly granted independence from the socialist state, Western models of change assume that it is politically independent and motivated to bring about substantial political change. Yet China's foreign-sector and domestic entrepreneurs are not at the forefront of democratization or the emergence of a civil society. Rather, as Pearson's interviews show, they are at the head of a new form of state-society relations in China, a hybrid of "socialist corporatism" and clientelism. This hybrid pattern has deep roots in Chinese history, as merchants in the Qing and Republican eras also exhibited a dual role toward the state: a mix of independence and state control. In its post-Mao form, the hybrid pattern of state-society relations has been shaped deliberately by the state to ensure that economic development does not spill over into democratization. Pearson concludes that this is a potentially stable situation, without an internal necessity for change. The transition from a planned to a market economy that began in China in the late 1970s unleashed an extraordinary series of changes, including increases in private enterprise, foreign investment, the standard of living, and corruption. Another result of economic reform has been the creation of a new class—China's new business elite. Margaret M. Pearson considers the impact that this new class is having on China's politics. She concludes that, contrary to the assumptions of Westerners, these groups are not at the forefront of the emergence of a civil society; rather, they are part of a system shaped deliberately by the Chinese state to ensure that economic development will not lead to democratization. Margaret M. Pearson is Associate Professor of Government and Politics, University of Maryland, and author of Joint Ventures in the People's Republic of China: The Control of Foreign Direct Investment under Socialism (1991).